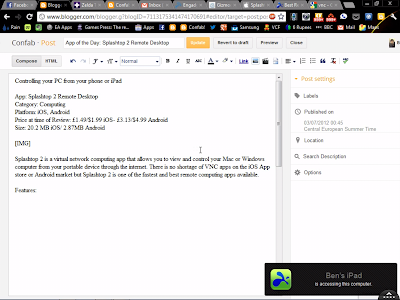 Splashtop 2 is a virtual network computing app that allows you to view and control your Mac or Windows computer from your portable device through the internet. 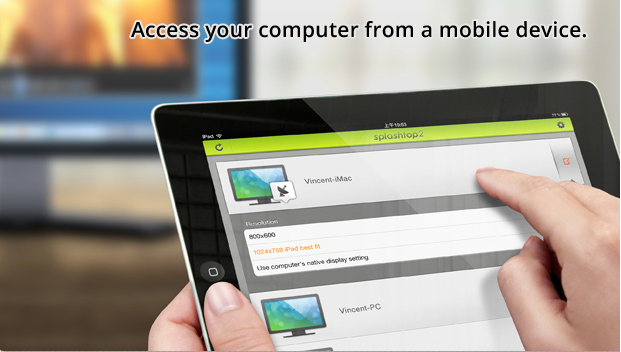 There is no shortage of VNC apps on the iOS App store or Android market but Splashtop 2 is one of the fastest and best remote computing apps available and currently has over 7 million users worldwide. * Access all your programs and files with 100% compatibility, including PowerPoint, Keynote, Word, Excel, Outlook, Quicken, IE, Firefox, Safari, and other PC / Mac applications. * Watch all kinds of videos, including Flash videos (Hulu, AOL Video, Yahoo Video, etc. ), DVDs, Media Player, that are only playable on your computer. * Browse all your content securely across the Internet with the same encryption algorithms and technologies as the biggest banks in the world. * Establish the fastest and most responsive remote connection with enhanced reliability and self-optimizing network capabilities. 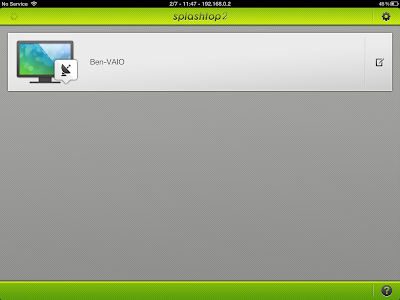 Splashtop 2 is an incredibly easy to use app with an intuitive user-friendly interface. To use it users just have to download the desktop client streamer for free from their website and set up a user account. Finding computers on the same Wifi network is automatic once you are logged in. Accessing your computer from a different internet connection than your home one is not any more difficult either. The requirement to log in with your user account or a IP address and secure code will prevent unauthorised access to your computer from other users. If you're the one family or friends go to when their PC has a problem, one great uses of such VNC apps is that you can install them on a family or friend's computer and help them out with problems (if it's not too severe) without needing to leave your home. As well as using it to view and access your computer remotely, Splashtop 2 allows users to turn their portable device's touchscreen into a track-pad to control the mouse on their computer with, which can be handy for those who use their computers as a media centre in their living room. It also allows you to stream audio through your portable device's speaker (or headphones if you wish) which essentially grants you the ability to stream all of your music and video collection straight to your device. The app streams video smoothly enough to be comfortable to watch and even has an option that will make the stream favour smoothness over sharpness for video playback. Forget to turn off or lock your computer, or transfer an ever so important document after you've left the building? Splashtop 2 has you covered. This looks really good, might give it a try! Fantastic site. Plenty of helpful information here. I'm sending it to a few pals ans also sharing in delicious. And naturally, thanks for your sweat! for? 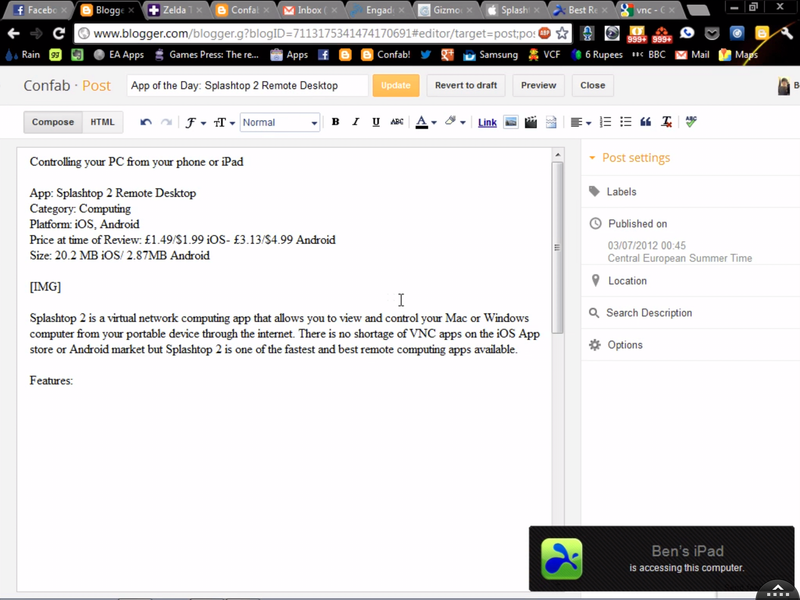 you made blogging glance easy. The entire look of your website is excellent, let alone the content! This paragraph offers clear idea in support of the new viewers of blogging, that really how to do blogging.